The VPO offers a tri-annual Concerto Competition for Emerging Artists, which provides an opportunity for aspiring musicians to gain experience performing with a full orchestra and to win cash prizes. 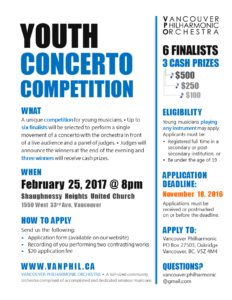 The goal of this competition is to support BC’s local young musicians to further develop their artistic talents. Applicants must be enrolled full-time in a secondary or post-secondary institution. 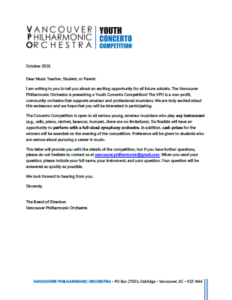 Finalists are selected through a competitive process for a rare opportunity to perform a featured work with the Vancouver Philharmonic Orchestra.